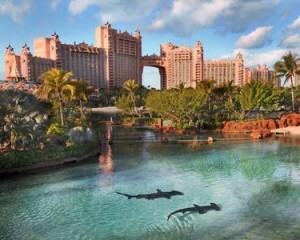 Atlantis, Paradise Island is a unique destination featuring the world’s largest open-air marine habitat, home to over 50,000 sea animals living in 14 exhibit lagoons. Aquaventure water park offers 141 acres of water fun including water slides, river rides, pools and beaches. Discover the secrets of the lost city of Atlantis in The Dig and interact with gentle dolphins and friendly sea lions in Dolphin Cay. Indulge in a world-class spa, play in the Caribbean’s largest casino and unwind in one of 19 bars and lounges, including Aura, the hottest nightclub in The Bahamas. Dining options range from gourmet to casual to quick and easy favorites. Atlantis is a shopper’s paradise with over 48 stores to choose from. A 7,500 sq. ft. sports center offers many choices while an 18-hole par 72 Tom Weiskopf designed golf course boasts challenging play. Kids’ activities abound with CRUSH Teen Club for kids 13 – 17, Atlantis Kids Adventures for children 3-12 and many more exciting programs on offer. On top of it all, kids 11 and under stay for free for a limited time! Contact Diana today to book your 2014 Atlantis getaway at diana@destinationsinflorida.com.